"Dear Nelson, the tour was very well organized and executed. I thank you, Wang Chi-ri and the rest of your team, and I will surely recommend you with other friends travelling to China." "Dear Nelson, it was very well organized and executed. I thank you, Wang Chi-ri and the rest of your team, and I will surely recommend your company Travel China Guide with other friends travelling to China." "Thank you for your message and follow-up after the tour. I am very impressed with your company and your service. Yes, after I heard of the delay in airport pick-up in Kunming, I was naturally very concerned. However, my parents quickly re-assured me that it was an unfortunate small mistake and it did not cause them much problem. 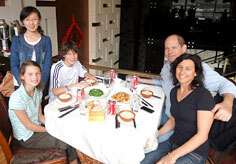 In fact, they were very satisfied with the tour guide in Kunming. After he arrived late, he was very apologetic and sincere in his regret. My parents liked this tour guide very much. They said that he was very educated and knowledgeable about Kunming. He was a nice, friendly, and experienced guide. They learned a lot from him, and enjoyed their visit very much. In Guilin, they also liked the guide. However, her personality was different from the Kunming guide. She was not that talkative or active. Still, a very nice lady, but my parents felt that she was more slow and did not provide much information about Guilin. They prefer a tour guide who is more excited, talkative, and friendly. This will cause them to feel more excited about the trip and enjoy it more. Please do not misunderstand, my parents said they liked both guides very much, but the Kunming guide was better. Only complaint they had was the Hotel in Guilin. I know the Sheraton is a 5-star hotel, and is situated in a good area with busy street markets across the hotel. However, my parents complained about the bad smell of the hotel. They said the condition was not so good. Even my mother became sick for 2 days in Guilin, and she thinks it was partly related to the bad smell and poor air-circulation in the hotel. I am not sure if this is just one case. I just wanted to provide you the comment, so you can check again. If our guests complain, you may want to consider finding another hotel. Aside from that, the entire trip and itinerary was excellent. My parents said they will recommend it to their friends. If we have any other plans to visit China, I will definitely you again. Thank you again for your great service." If we have any other plans to visit China, I will definitely use you again. Thank you again for your great service." 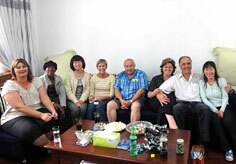 "Thanks so much for the wonderful tour you organised for me during my recent trip to China. My tour guide Angela and the driver Mr Jiao were fantastic. They are both assets to your company and I would appreciate it if you would pass on my sincere thanks to them for the great service they gave me during my stay in Beijing. I thoroughly enjoyed all of the spots we visited. I especially enjoyed the Hutong tours. I have one suggestion however. Have you ever considered a bike tour to places such at Tianamen and the Palace. It would make a lot of sense to me that with the traffic conditions in Beijing and the short distance from the hotel to these spots, a bike tour on this day would be quicker and more flexible than taking a car over to these particular places in the thick traffic. I would thoroughly recommend this tour to anybody. It was very interesting, informative and I had the time of my life."